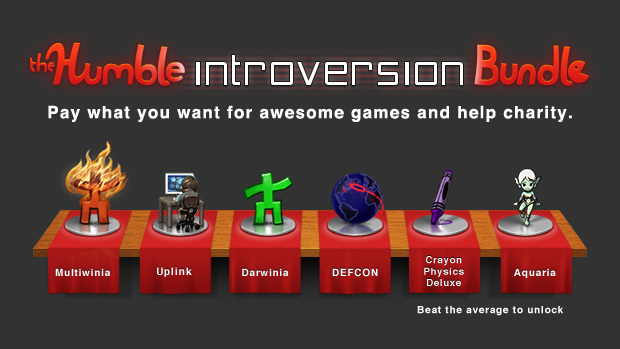 The famed “pay what you want” Humble Bundle is at it yet again, this time with a bundle of games from UK indie game studio Introversion. The games included this time round include Uplink, a hacking sim; RTS Darwinia and sequel Multiwinia; and Cold War tactical sim DEFCON. You’ll get two prototype tech demos as well: the Subversion City Generator, which does exactly what it says, and the Voxel Tech Demo, which explores destructible voxel buildings. While you can choose to pay as much (or as little ಠ_ಠ) as you want, if you pay over the average price, you’ll get Bit Blot’s Aquaria and Klooniegame’s Crayon Physics Deluxe as bonuses. As always, you can choose part or all of your money to go to the devs, the Electronic Frontier Foundation or the Child’s Play Charity. Supporting indie devs, charity and getting games at the same time? Wonderful.